Materials: Knitpicks Palette, 1 skein each of Bark (MC), Brindle Heather, Nutmeg, Twig, Salsa Heather, Fawn, Golden Heather, Tan, and Ivy. Needles: 16 or 24 inch circular needles, size US 6, double point needles, size 6. Gauge: 20 st/12 rows=4 inches, knit double stranded on size 6 needles. 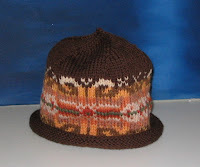 Pattern: The whole hat is knit double stranded using two strands of the same color of yarn. Using MC, cast on 102 stitches on circular needles. Join, being careful not to twist, and work in stockinette stitch for 2 inches. Begin working Fair Isle chart. Chart is 35 stitches wide and will be repeated 3 times in each round. Knit one round of MC. Place marker, [K17, place marker] 5 times, k to end. 6 markers on needle. Round 1: [k to 2 sts before next marker, k2tog] 6 times. Repeat rounds 1 and 2 9 times, until there are 54 stitches remaining. Repeat round 1, switching to double point needles when needed, until there are 6 stitches left. Break yarn, and thread yarn through remaining stitches and pull tight. You're right! I'm changing that right now. Should be 20 sts/ 4"
This is gorgeous. Is it meant to fit a child? If so, what age? Or does it fit an adult? 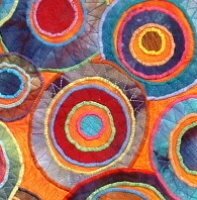 My patterns are free, but you're welcome to donate if you use them!